1. A morbid impulse, or obsession, to travel or wander around. 2. A compulsive wandering away from home. 1. A morbid attitude toward the members of one’s family [domineering behavior at home and humility toward other persons in authority]. 2. A pathological dislike of the members of one’s family often resulting in a feeling that one must get away from them. In psychology, a mental attitude whereby one is hostile and domineering toward ones own family but who is submissive to those in an outside authority. 1. An unhealthy over concern with oneself: People who are egomaniacs talk constantly about themselves or their own activities, to the exclusion of other people and everything else. 2. An extreme self-centeredness or self-appreciation: Egomania is not regarded as a mental disorder, but such extreme self-conceit is sometimes said to indicate an underlying mental instability. 1. An abnormally self-centered person. 2. Someone who considers himself or herself to be extremely important and able to do anything that he or she wants to do. Egomaniacs are always me-deep in conversation and when two of them meet, it becomes a case of an I for an I. 1. An abnormal, persistent compulsion or desire by people to see themselves in mirrors: The looking glass in the patient's room was covered in an effort to help him manage his eisoptromania so he could no longer fixate on looking at himself all the time. 2. A love of mirrors or of seeing oneself in a reflecting glass: The vain woman had the halls in her home lined with pier glasses, or tall mirrors placed between windows; so she could indulge her eisoptromania and see herself as she walked from room to room. Someone who takes every possible opportunity to look at himself or herself in a mirror: The movie star acted like an eisoptromaniac, stopping to look at himself at every opportunity as he walked past windows or cheval glasses. 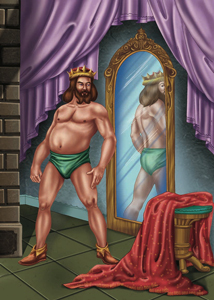 The Emperor was often admiring his physique which was an example of his eisoptromaniac mentality. 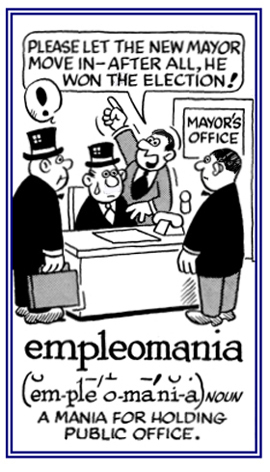 A compulsive desire to have a job or employment in a public office: Robert’s family thought that he had a case of empleomania because he was never satisfied with his life unless he had an important position in the city government. © ALL rights are reserved. A person with the compulsion to hold public office. Showing page 8 out of 27 pages of 403 main-word entries or main-word-entry groups.